Believe it or not, and you better believe it because it’s true, the octagon returns with two shows this week after taking just one weekend off after their back-to-back shows on Fourth of July weekend. Overkill? Possibly, but at least both of this week’s cards are of the non-pay-per-view variety. “UFC Fight Night: Cowboy vs. Miller” takes place Wednesday inside Revel Casino Hotel in Atlantic City, New Jersey. 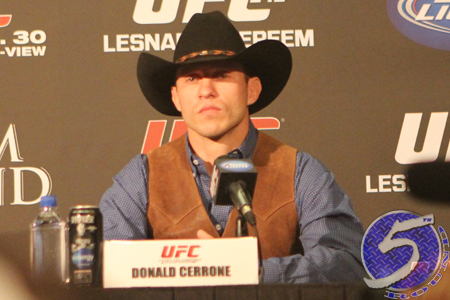 A lightweight scrap between Donald Cerrone (pictured) and Jim Miller headlines the gig. A 155-pound shootout with Edson Barboza and Evan Dunham serves as the co-featured attraction. Fox Sports 1 broadcasts the main card live starting at 9PM ET/6PM PT.